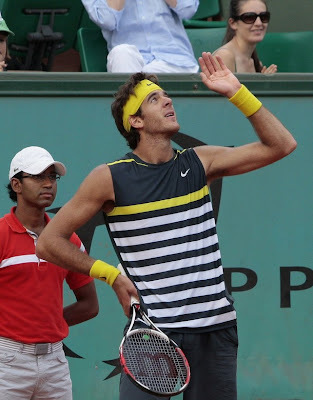 Del Potro beat Robredo as expected. Stosur dusted up Cirstea and looks awesome. But Kuznetsova took Serena down and that’s all you’ll read about. Serena refused to give any credit to her opponent as usual but Sveta did play smart and kept her head (when all those around are losing theirs) and deserved to win. Dominika destroyed Sharapova but Safina will be more difficult and will return everything. She also has more weapons and the superior game (and dare we say better temperament?) But Cibulkova could win this and next year she might. Not this year sorry. Safina in three. Let’s assume Sveta won’t be blown away by the big serve and forehand like Cirstea was and that Stosur maintains her cool and big booming game. This should be a good contest. Kuznetsova in three. Ten reasons to love tennis.